How does the old saying go? The best-laid plans of mice and men don’t always work? Traveling can be tiring and preparedness is a must. When I travel with the kids and it is one parent to three kids, it sometimes leads to small errors. I travel so much that sometimes I am surprised at what I don’t find in a rental home, or what I should pack and did not, but this hack will solve the dilemma. My coffee filter hack has saved me om a few vacations because while I really plan ahead, organize and makes lists to prepare for everything, sometimes stuff still slips through the cracks. The beauty of a hack is like a person reinventing the wheel just a lot less difficult. I struck gold as I like to think of it, in the midst of our travels, as we were staying in a rental home. I needed to utilize the microwave it dawned on me that I needed a little help with something I was about to prepare. 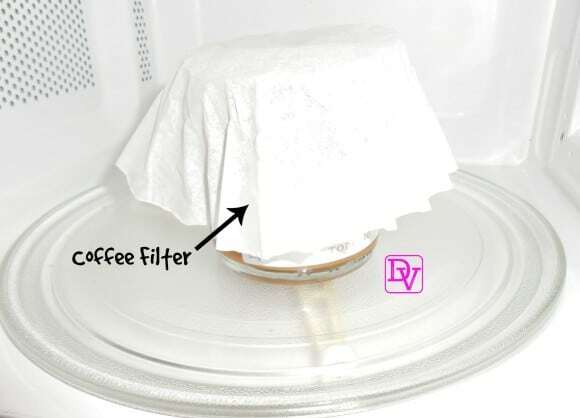 Here’s my coffee filter hack that will have you utilizing all of those extra coffee filters in your home to save you precious time and to keep the cleanup easy. The word HACK to me is such a strange little word but so inventive. A hack is a way to get through life using what we already have to get the job done without having to run out to finish what we are doing. I did not have wax paper or a way to cover the item that was really going to spatter the microwave. I did not want to leave the microwave totally covered, and inspiration delivered a hack! It was late at night, and the kids wanted a snack so I was not running back out to the grocery store. Plagued by the thought that I would be scrubbing a microwave at 11 PM at night, I rethought my strategy and suddenly gave myself a life hack! I had to cover a jar, and it needed to be microwaved. I did not want to spatter but I was not going to use a plate because I knew that would just lead to another mess. So what I did, was reinvent a type of cover that was perfect for the jar and it worked with so many other things while we were away that week. There was no way I was going to use 150 filters in one week so I was fine with using the filters to cover my plates in the microwave. Rather than using it right side up, I inverted it and used it right side down. It is paper so it takes the moisture on and wicks it away. It is perfect as it makes its own dome. If you need a bigger you just flattened it and you don’t use it with the creases. It is actually the perfect solution for the smaller size type cover items that you need in the microwave. This is a picture of the jar that I used whenever I was using my coffee filter hack. I guess you could say desperation leads to inspiration as now I have a way to utilize all those extra coffee filters that have been accumulated since the introduction of a Keurig into my home, lol! Plus I found a killer espresso maker under 200 dollars making me feel like I am back in Italy with every sip, so goodbye to those coffee filters and hello to creative coffee filter hacks. Coffee filters are a practical item that many of us, buy in bulk and never really use the entire stack, and it does make the perfect cover for items in the microwave. It saved me time because I did not have to scrub microwave. Lavishly live life out loud with this coffee filter hack. What other kitchen hacks do you use your coffee filters for? Share them, I’d love to hear! I love these hacks so much. Gonna apply it to me! I love coffee and thanx to share this information.